VATICAN CITY (CNS) — Repeating his recent calls for peace in the Middle East, Pope Francis urged Christians to wage a “deeper war” against evil, including the illegal arms trade that he said drives much of the world’s military conflict. 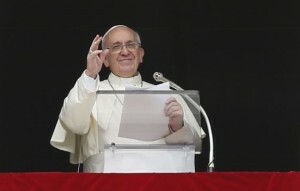 The pope made his remarks Sept. 8, before praying the noon Angelus with a crowd in St. Peter’s Square, where the previous evening he had led a four-hour vigil for peace in Syria, the Middle East and the world. “This war against evil means saying no to fratricidal hatred, and to the lies that it uses; saying no to violence in all its forms; saying no to the proliferation of arms and their sale on the black market,” the pope said. “These are the enemies we must fight, united and coherent, following no other interests but those of peace and the common good,” he said. Following the Angelus, Pope Francis thanked those who had participated in the Sept. 7 vigil, which drew an estimated 100,000 to the square. The pope asked listeners to pray for an end to Syria’s civil war, and for peace in other beleaguered Middle Eastern countries: stability and continued “peaceful coexistence” in Lebanon, an end to “sectarian violence” in Iraq, and progress in the Israeli-Palestinian peace process.